Roebuck v. Trib Total Media, Inc.
Trib Total Media, Inc.; James Cuddy, Jr.; Frank Craig; John Doe a/k/a "None"
Karen Roebuck, a former employee of the Pittsburgh Tribune-Review, commenced legal action against Tribune-Review publisher Trib Total Media, two of its editors, and a John Doe defendant over comments posted to the unaffiliated VoyForums site, self-described as "a forum to talk about issues affecting the Pittsburgh media scene." Roebuck used an unusual procedure which allows her to commence the action using a "writ of summons" without filing a complaint. In a motion to extend time to file a complaint, Roebuck indicated that she intends to bring a libel action based on two statements posted on VoyForums by an unknown person using the pseudonym "None." The court granted Roebuck 60 days to conduct discovery in support of filing a complaint. In February 2010, Roebuck served a subpoena on VoyForums seeking documents showing the IP address for "None." VoyForums posted a notice on its forum indicating that it would comply with the subpoena unless someone came forward to file a motion to quash within 30 days. 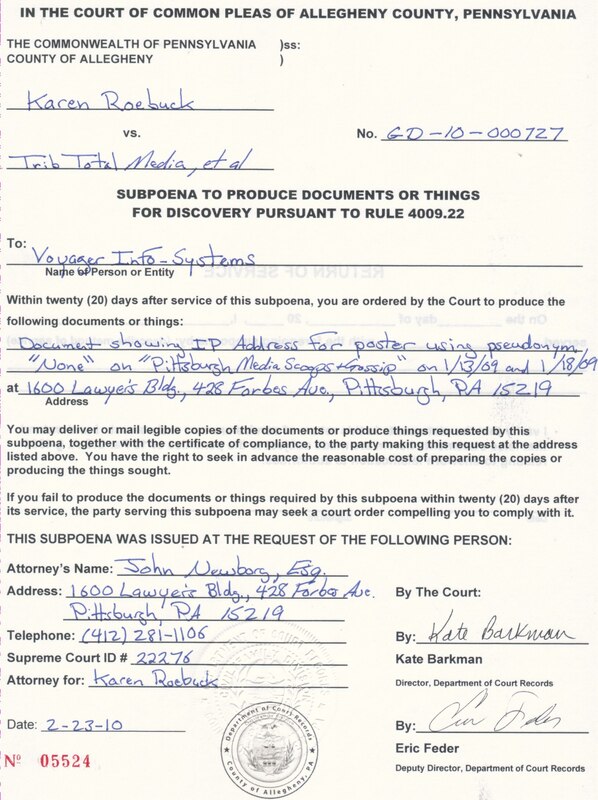 Defendants Trib Total Media, Frank Craig, and James Cuddy filed a motion to quash the subpoena on March 26, 2010, and supplemented it with a brief on April 5. The brief argues that the subpoena is a "nullity" because it was served on VoyForums, which is based in California, without issuing from a California court. It also argues that Roebuck has not made the showing required to unmask a pseudonymous speaker under Melvin v. Doe, 49 Pa. D. & C. 4th 449 (Allegh. Co. 2000).